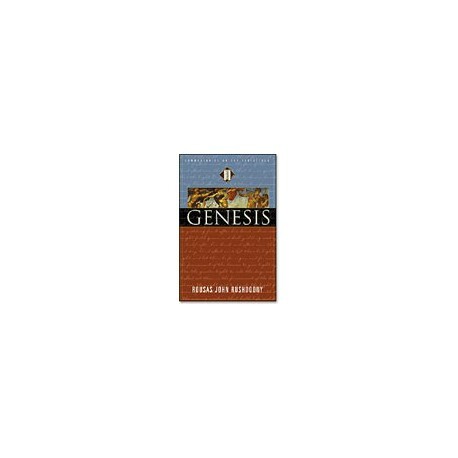 A commentary on Genesis that begins with a literal six-day creation as foundational to all of Christian theology. By Rousas John Rushdoony. A commentary on Genesis that begins with a literal six-day creation as foundational to all of Christian theology. Genesis does not merely begin the Bible, it is foundational to it. Despite its critical importance, however, recent years have seen both humanists and churchmen routinely sneer at anyone who regards Genesis 1-11 as historical. Belief in the myth of evolution forces one to accept trillions of miracles to account for our cosmos. Spontaneous generation, the development of something out of nothing, and the blind belief in the miraculous powers of chance, require tremendous faith. Darwinism is irrationality and insanity compounded. Theology without literal six-day creationism is alienated from the God of Scripture because it turns from the God Who acts and Whose word is the creative word -- the word of power -- to a belief in process as god. The god of the non-creationists is the creation of man and a figment of their imagination. It is manifest that they vindicate their position by willingly playing games with the Bible. Evolutionists are both naive believers and irrationalists. They violate the scientific canons they profess with their fanatical and intolerant belief in evolution. Genesis 1-11 is the linchpin of Biblical theology. The church needs to re-study this pivotal text to recognize and submit to its truth and its important place in theology.